Hardware manufacturer Lenovo today launched its ThinkSmart Hub 500 for businesses with remote teams. The all-in-one video conferencing device was developed with Microsoft and Logitech, and has a 360-degree rotatable 11.6-inch display. It runs Microsoft Windows 10 IOT (Internet of things) Enterprise and uses Logitech cameras. It also features the Dolby Audio Premium sound experience with 360-degree array microphones, a touch display to control the meeting and large external displays. 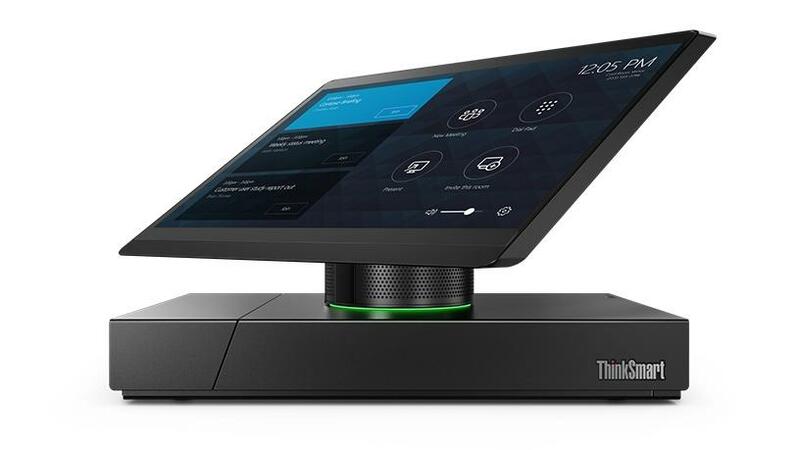 The ThinkSmart Hub 500 is a Skype Room Systems device that manages collaboration within modern meeting rooms where teams can be located anywhere in the world. The system allows meeting participants to easily connect to a Skype for Business meeting and share content with the group seamlessly without needing to plug in any other cable or laptop. "The continuing evolution of technology and the focus on digital transformation brings smarter devices to enable improved collaboration spaces and meeting environments," says Lenovo in a statement. "92% of businesses are planning workplace transformation initiatives (WTI) to build smart offices that enhance individual and collaborative work experiences for local and remote users. "The exponential growth of smarter offices creates opportunities for hardware and software vendors, resellers and systems integrators, as customers look to fuel investments in WTI." The company says the problem with most of today's meeting rooms is that they have their own projectors or displays and audio speaker phones, and often don't have built-in support for video conferencing. Lenovo hopes the ThinkSmart Hub 500 will cut down on the time it takes for users to set up meetings in conference rooms. "Workplace transformation begins with collaboration," says Julian Pienaar, Lenovo's pre-sales and product technologist. "As workforces are changing, businesses need to provide tools to enable efficiency and teamwork in the office and with colleagues around the world. One obvious need for change is in how meetings are conducted, including the ongoing issue of the wrong technology to get meetings started quickly. "This wasted time can cost businesses millions in lost productivity, so we're thrilled that the ThinkSmart Hub 500 can help solve that issue. "In addition, the ThinkSmart Hub 500 is a very affordable video conferencing facility; competitor products with similar capabilities are around five times the price of our device, even though they are far less user-friendly. "Together with Microsoft, we are excited to combine our skills and expertise to help customers enable smarter meeting rooms with devices like the ThinkSmart Hub 500." It is priced from R30 000 to R35 000, depending on the type of Logitech camera selected.